Signature Moves- Mind Bend: The user uses its illusory abilities to bend the opponent's mind to it's will. (Power: ---, Type: Psychic, Acc: 100%, Status move) The affected opponent's stats (ATT, DEF, SP. ATT, SP. ATT, SPEED) drop by 1 stage. 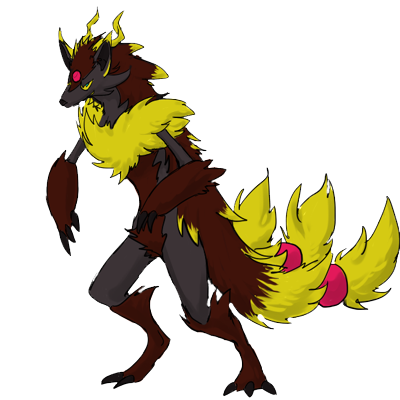 Pokédex Entry- Zorombra was a pokemon feared in medieval times, sought out as witches' familiars. They seemed to have disappeared after the Witch Trials, keeping to the shadows. It can implant false memories into its victims. These pokemon are generally not the best kind, as their evolutionary methods require a lot of deceit. Therefore, not many were missed when they disappeared. Many witches and wizards were thought to be Zorombra in disguise, and these pokemon were treated as such. These pokemon are intelligent and detail-oriented in order to pull off their grand illusions.